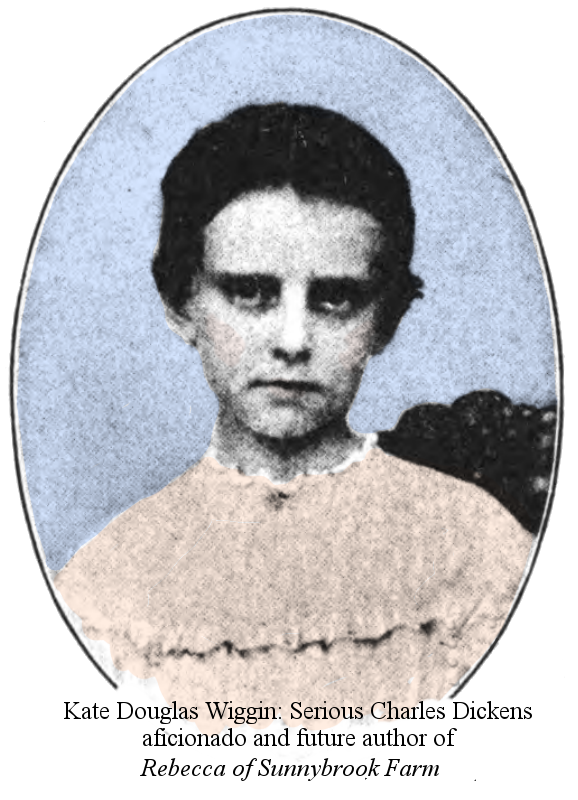 Kate Douglas Wiggin, the little girl pictured above, authored several books of her own as an adult. Below she recalls her childhood chance meeting with Charles Dickens, who was in the United States lecturing. as many children did. Wiggin idolized Charles Dickens and read and re-read his popular works. So, if you feel you only slogged through a Dicken's novel this summer, know that legions of literate 19th Century teenyboppers really, really thought his work was riveting. And whether to amuse himself or to amuse me, I do not know, but he took out a notebook and pencil from his pocket and proceeded to give me an exhausting and exhaustive examination on this subject; the books in which the dull parts predominated and the characters and subjects which principally produced them. He chuckled so constantly during this operation that I could hardly help believing myself extraordinarily agreeable, so I continued dealing these infant blows under the delusion that I was flinging him bouquets. It was not long before one of my hands was in his and his arm around my waist while we talked of many things. They say, I believe, that his hands were “undistinguished” in shape, and that he wore too many rings. Well, those criticisms must come from persons who never felt the warmth of his handclasp! For my part, I am glad that Pullman chair cars had not come into fashion, else I should never have experienced the delicious joy of snuggling up to Genius and of being distinctly encouraged in the attitude. “Six times! — good, good! I am glad that you like Davy; so do I — I like it best, too!” he replied, clapping his hands. And that was the only remark he made which attracted the attention of the other passengers, who looked in our direction now and then, I have been told, smiling at the interview, but preserving its privacy with the utmost friendliness. Here again my new friend’s mirth was delightful to behold, so much so that my embarrassed mother, who had been watching me for half an hour, almost made up her mind to drag me away before the very eyes of our fellow passengers. I had never been thought an amusing child in the family circle; what then, could I be saying to the most distinguished and popular author in the universe? And Dickens thought he did, which, perhaps, is not strange, considering that he was the author of their respective beings. Mr. Harry Furniss declares that Great Expectations was Dickens’s favorite novel, but I can only say that to me he avowed his special fondness for David Copperfield. “Did you want to go to my reading very much?” Dickens asked me. I looked up a second later, when I was sure that the tears in my eyes were not going to fall, and to my astonishment saw that Dickens’s eyes were in precisely the same state of moisture. That was a never-to-be-forgotten moment, although I was too young to appreciate the full significance of it. “Yes, I cry when I read about Steerforth,” he answered quietly, and I felt no astonishment. “We cry the worst when it says, ‘All the men who carried him had known him and gone sailing with him, and seen him merry and bold,’” I said, growing very tearful in reminiscence. “You are not traveling alone?” he asked as he arose to put on his overcoat. He replied, “You are a passed-mistress of the art of flattery!” But this remark was told me years afterward by the old lady who was sitting in the next seat and who overheard as much of the conversation as she possibly could, so she informed me. Dickens took me back to the forgotten mother and introduced himself, and I, still clinging to his hand, left the car and walked with him down the platform until he disappeared in the carriage with Mr. Osgood, leaving me with the feeling that I must continue my existence somehow in a dull and dreary world.